November 2011 – Kia Drew | Styled by Life! It’s about that time for you to start knowing the what, when and how of minding something! That something, of course is your decision to move forward in the modeling industry. Let’s take a few minutes to explore the WHAT, WHEN and HOW to consider the basics needed to advance as an up and coming model! Here you ask yourself, “what business am I trying to mind?” Glad you asked! That would be the business of modeling Once you figure out rather this is something you like do for a hobby or it’s something you want to explore as a career, you can determine how you want to move forward. Let’s say you want to deal with the decision of making modeling a career. From here we can transition into the next portion of this article…..
“When should I start minding the business of modeling?” Now that you want to begin a career in modeling, you should know a few basic steps and terms to help you along the way. You decide what area of modeling you want to excel in (commercial print, promotional, fashion, beauty, runway, etc.) Make sure you are ready to handle the rejection, not take things personally, and proceed in landing auditions/casting calls regardless of the prior outcomes. Don’t worry about what others are or are not doing, focus on YOU! Do some research on the business as a whole to get a general idea of what you’re getting into. Now! You have decided that you want to model and are starting to get a better understanding of what modeling is about, it’s time to get into the basic steps and terms. The below will answer the question “how do I start minding the business of modeling?” Take notes! Well that’s all folks tune in next week with another exclusive interview with working model Monique Pridgeon!!!!!!!!!!! Why Can’t I Juste B…….! Have you ever heard of an Organic Nail Bar? You may ask yourself what that involves. Well let me tell you! 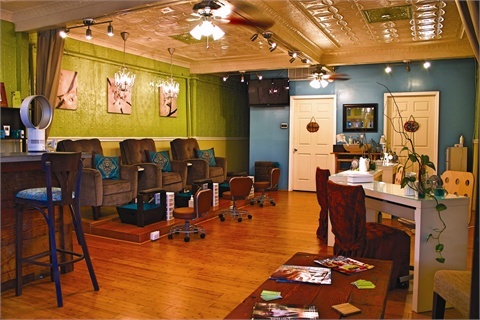 Juste B…an Organic Nail Bar, is the only conscious nail salon in Baltimore, MD where you can get manicures, pedicures waxing and more all without harsh chemicals! This chic shop is the at home feel you’ll want while getting pampered. There you have it! Models, we always need to maintain our appearance, and doing it consciously is always a plus. Also ladies , along with your little ladies, neices , cousins, mentees, this is a unique shop that provides classic services. Make sure you check out Juste B and make an appointment today! Be Conscious! Be Healthy! Be Relaxed! Just passng along some information I just recieved!!! See you there! MODEL CALL FOR TRACI LYNN JEWLERY FASHION SHOW! NOTES: You must be 14 years of age or older. Please bring a photo that can be kept and wear heels as you will be walking! Got any more questions let me know, I’ll try to get some answers! My Interview with Model, Jamia Eaton!!!!!! I had a Runway Run-in!! What is that you ask?! A Runway Run-in is my interview segment of the blog. All interviewswill be listed under this category. I had the privilege to have my first interview with model Jamia Eaton. When I tell you that there are working models under the “radar”, please believe me! Read the interaction that I had with Jamia below. She has experience in other markets besides the US, like London and South Africa just to name a few. Ok ok….im done rambling! Enjoy the interview! AMM: Hi Jamia, first I would like to take the time to thank you for allowing me to interview you for my blog. Just wanted to share your experience as a working model and what we can learn from you! My first question is how did you get started in the modeling industry? AMM: So what did you decide to do regarding your weight!? Jamia: Who wants to gain weight!!! (both she and I begin laughing). Of course I decided to lose the weight! I was also scouted in New York one day while there shopping for my upcoming wedding after all the events in Atlanta begin happening. The rest is history! AMM: That is awesome! So what’s your most enjoyable category of modeling that you have done so far? Jamia: I did enjoy fashion, which is where I started, but now that I am older I am transitioning into commercial print and lifestyle. I have to be trained in this category! This fits me now, especially since I am a Christian and am older than when I first began. AMM: The theme of my blog is what a model models his/her life after. What would be something that you model your life after in your daily living? Jamia: I would have to say I model my life after Christ. At first I had big dreams! Certain jobs signified that you “made it” in the modeling industry like, doing work for Victoria Secrets and Sports Illustrated to name a few. My perspective on that changed when I learned more about Christ. Jamia: At first I would lie about my age to stay marketable as well as me aspiring to do those most wanted jobs that made you “official”. Because my mind was changing (growing in Christ), I did not work for a year. As my faith grew I started changing my surroundings and changed the way I was handling things. After hearing a sermon on lying, it really made me think about my decisions and make some adjustments. AMM: I am so glad to hear that! What you said was a prime example of not letting the modeling industry change who you are, but letting it adjust to YOUR lifestyle! What advice can you give to us young girls and woman who want to get started in the modeling industry? Jamia: My advice would be to stay true to who you are! The media paints a false picture of success, in which a lot of us embrace. There are always choices, stay on the path and don’t compromise your beliefs, ever! AMM: That is great advice and a great story! Thank you again for taking the time to speak to me, where can we reach you to learn more about you and your career? Jamia: You’re welcome, you’re welcome! You can find me on Facebook, or my online portfolio! ***What an interview! I would like to thank Jamie Eaton again for a great conversation! She gave me some great tips (outside the interview) on life and on my aspirations to become a model. There is such thing as working models ladies! You don’t have to be “known” to be successful as a model! Below is Jamia’s contact info if you want to know more about her! Now that you have a general definition of what a model does and what may be expected of him/her, it is time to determine rather you want to pursue modeling as a hobby or a career! O yes! There is a difference. We all know a hobby is something you enjoy doing, yet do not have the time or may not want to do it consistently. Ideally, we would all loooove to have our favorite hobby as a career….i’m working on it myself! Ask yourself, what are the reasons you are even interested in this industry? If you do not have even the slightest bit of interest and are doing it because it looks “glamorous”, my friends, it won’t last long! Always remember to do your research on the industry. It is cut throat (doesn’t mean you have to be) and very competitive. But if you find your niche, please! No one can stop you! Now, you can get with the hobby or you can get with a career! Me personally, the career is where it’s at!!!! Be up for the challenge….I can assist you down the road and you can assist me! If your career bound in the modeling industry, look out for the next post on learning the business. So you want to model huh? Well lets start with the basics. In a nut shell, being a model is someone who represents a product or service for a client, to showcase their goods to the consumer. This can include clothing, cars, jewelry, accessories, consulting services or any thing else. This means you have to prepare your self to be a representative for the category(s) you want to work in as a model. In preparing you need to know your strengths and weaknesses, begin practicing what you are trying to accomplish and ALWAYS be ready. Your preparation will also include your appearance. Keep your self maintained with natural type of makeup (or none), polishes and clean, read-to-style hair. You are a blank canvas ready to be painted on. Keep that in mind! If you need more tips let me know! This should be a good start 🙂 Enjoy your lunch!